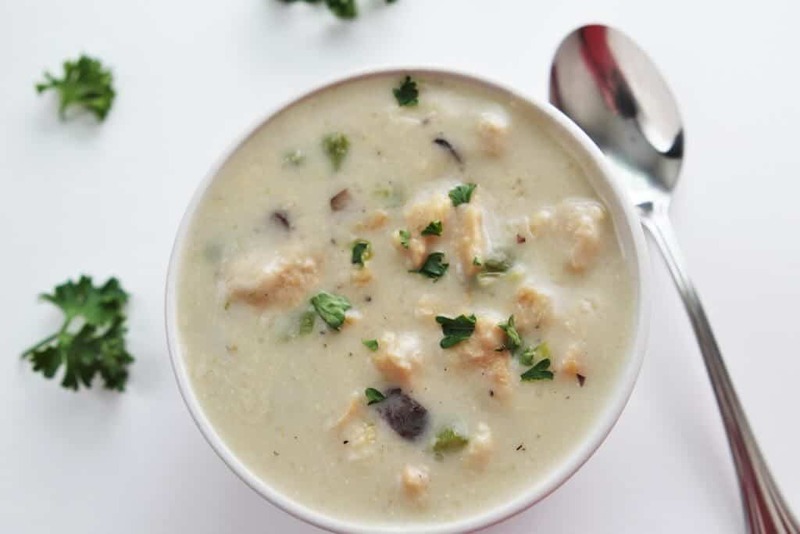 This vegan cream of chicken soup is dairy free and can easily be made gluten free and soy free too. It’s a protein-packed hearty soup that’s pure vegan comfort food! 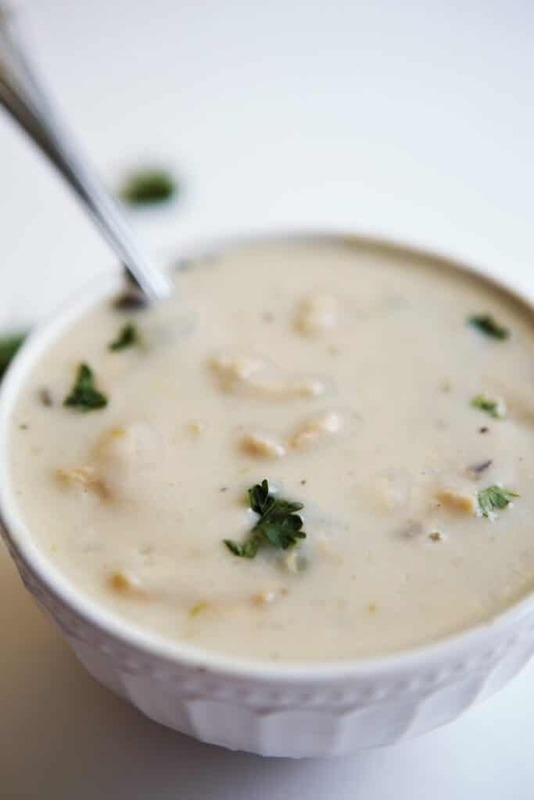 Use any vegan chicken product you like to make this rich and creamy soup that your whole family will love! Mushrooms –Optional to flavor the soup and give it more texture. Broth –I like to use the Not Chick’n broth cubes because my family likes that flavor, but any vegetable broth will work. 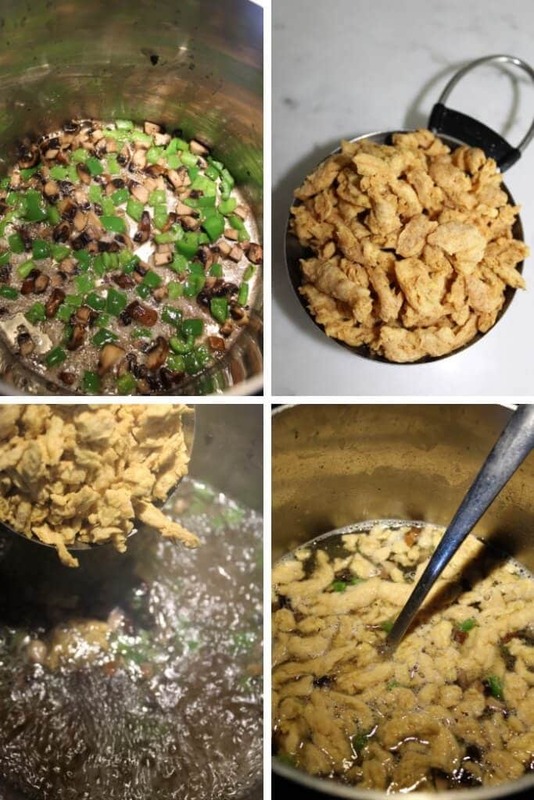 Vegan Chicken – You can use any vegan chicken strip that you like. I usually use Butler Soy Curls because they are gluten-free and have a nice texture. They come dry and are shelf stable and will soak up the flavor of whatever you rehydrate them in. If you need it to be soy free, you can use Beyond Meat chick’n stips. If you don’t need a gluten-free option, most major grocery stores sell vegan chicken strip products that will work well. Nutritional Yeast –Nutritional yeast gives your soup a savory slightly cheesy flavor (optional). Salt and Pepper –to season the soup. Plant-Based Milk –Any PLAIN flavored plant-based milk will make it creamy. You also may want to use unsweetened milk if you don’t want it too sweet. I find that the organic West Soy brand soy milk works great for soups and other savory recipes because it is not overly sweet. Best of all, they sell it at the Dollar Tree for a dollar! 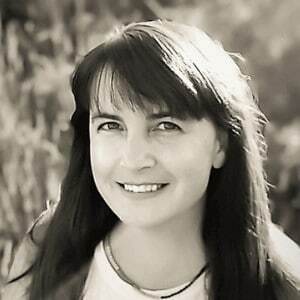 Fat –Any neutral flavored oil or vegan margarine will work to make a vegan roux. Plus a little to saute the veggies if you choose to add them. Flour –Regular all-purpose flour will work well, or if you need it to be gluten-free, I find the gluten-free flour mix from Trader Joe’s works the best for making a gluten-free roux. You can also omit the roux method and make your soup fat free and gluten free by using corn or potato starch to thicken it. 2 soup pots –One for making the broth and 1 for making the roux. A ladle – for scooping up the broth. Whisk –for stirring the roux. 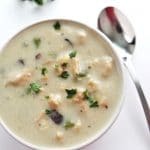 How do I make vegan cream of chicken soup? Chop mushrooms and peppers into small pieces. Sauté the mushrooms and peppers in a tbsp oil over medium-low heat and sprinkle with a little salt. Cook the mushrooms and peppers for about 5 minutes until they release their juices. Add the broth and spices and bring to a slow boil. If using soy curls – break up the dry soy curls into small pieces before adding to the broth. (If using other vegan chicken stips seen notes below). Dump in the Butler Soy curls and cook for another 3-4 minutes until they are soft. Pour in the plant-based milk into the soup. Thicken the soup by making a roux. Heat oil or soy margarine in a separate soup pot. Add flour to the oil and stir the mixture with a whisk until smooth. It will start to bubble and thicken slightly and look like the picture below. Skim off ladles full of the broth out of your soup, leaving large pieces of vegan chicken and veggies behind. Add the hot broth from the chicken soup one ladle at a time, stirring well between each scoop. Add the remaining soup with the chicken and veggies once most of the broth has been incorporated into the roux. When you first add the broth to the oil and flour mixture, it will become very thick at first and look like paste. (Like the picture below). Don’t worry, it will thin out and be the right consistency once you add all the broth. Be sure to stir it well between each ladle of broth to keep it smooth. Use a spoon to scrape the bottom corners of the pan to make sure to get any of the roux that has stuck to the corners. How do I make a gluten-free roux? 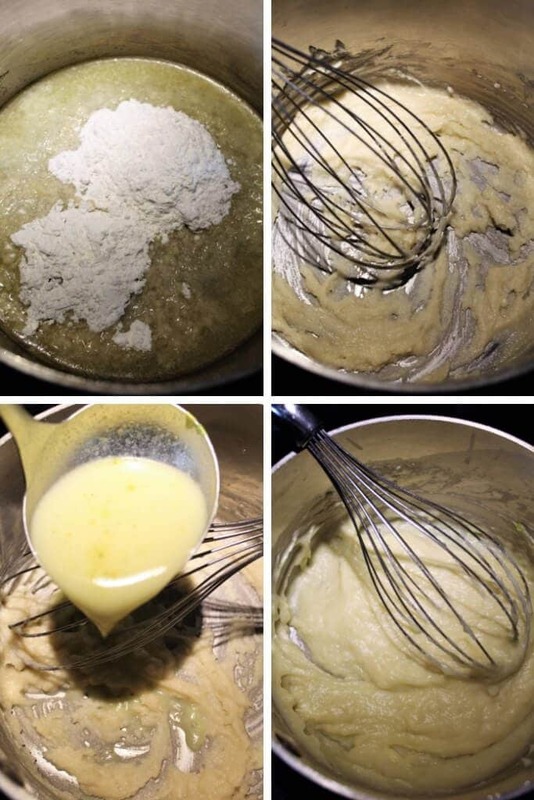 You can make a roux using gluten-free flour instead of wheat flour. Just be sure to use a gluten-free flour mix that does not contain sorghum flour. When I have tried it using any mixes with sorghum flour, it has had a weird slimy texture. I usually use the general gluten-free flour mix from Trader Joe’s and it works well for me every time. Use 2 cups or 16 oz. of a vegan chicken product to replace the soy curls. (One cup of soy curls will soak up about 1 cup of broth and double in size). If you are using chicken strips, add them with the mushrooms and peppers and saute them for a few minutes before adding the broth. Make sure reduce the broth if you are NOT using soy curls. Add only 4 cups of broth instead of 5 since the soy curls soak up about 1 cup of the broth. How do I make the cream of chicken soup fat-free? If you want this soup to be fat-free, simply thicken it with cornstarch (or potato starch) and water. (Use ¼ cup cornstarch dissolved in ½ cup cold water and then add it to the hot broth at the end once all other ingredients have been added. Then heat it until it bubbles and thickens). This is still a delicious soup made this way, just not quite as rich and creamy as the roux method. 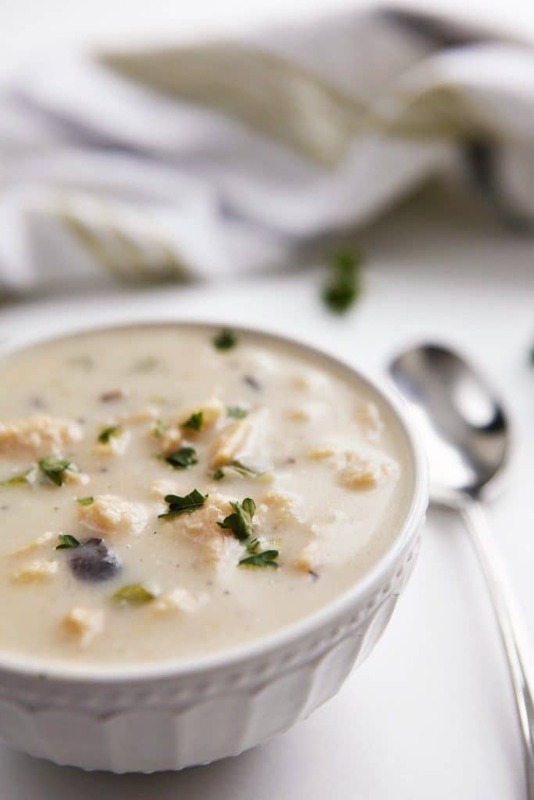 This vegan cream of chicken will keep well in the fridge for 3 days or in the freezer for up to 3 months. Serve it with some vegan Caesar salad or gluten-free vegan breadsticks, my Vegan Cheddar Bay Biscuits and make it a meal! If you like this vegan cream of chicken soup and you like spicy food, then try my Vegan Green Chile Chicken Stew that I made all of the time when I lived in New Mexico! You may also like my other creamy vegan soups like vegan cream of broccoli soup or vegan cream of mushroom soup! Pin the vegan cream of chicken soup recipe for later! 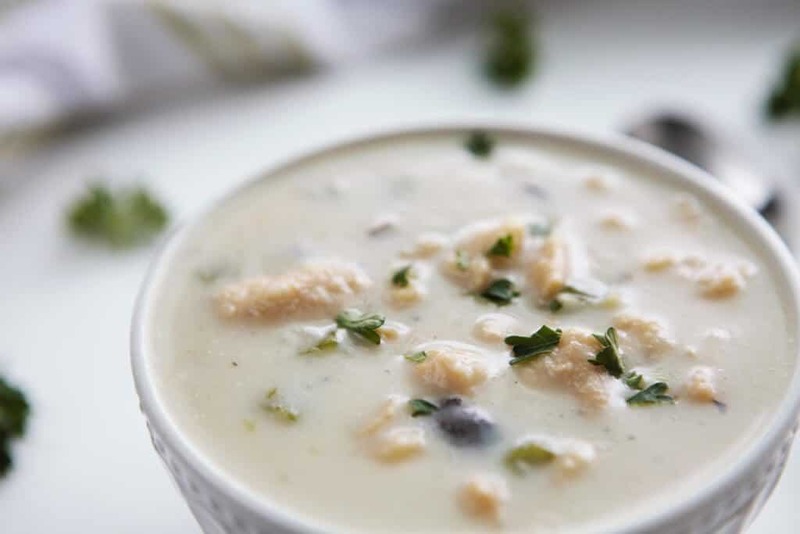 A rich and creamy dairy-free cream of chicken soup made with vegan chicken. 5 cups water (or 5 cups broth of choice if not using bullion cubes). If using soy curls - break up the dry soy curls into small pieces before adding to the broth. (If using other vegan chicken stips seen notes below). You can also thicken the soup with cornstarch (or potato starch) and water. Use ¼ cup cornstarch dissolved in ½ cup cold water and then add it to the hot broth at the end once all other ingredients have been added. Then heat it until it bubbles and thickens. This soup was delicious! Total comfort food! I missed Cambell’s cream of chicken and this was just as good! Thanks Jenna! It’s so creamy and comforting, I hope you love it as much as we do!